Well, guess what? 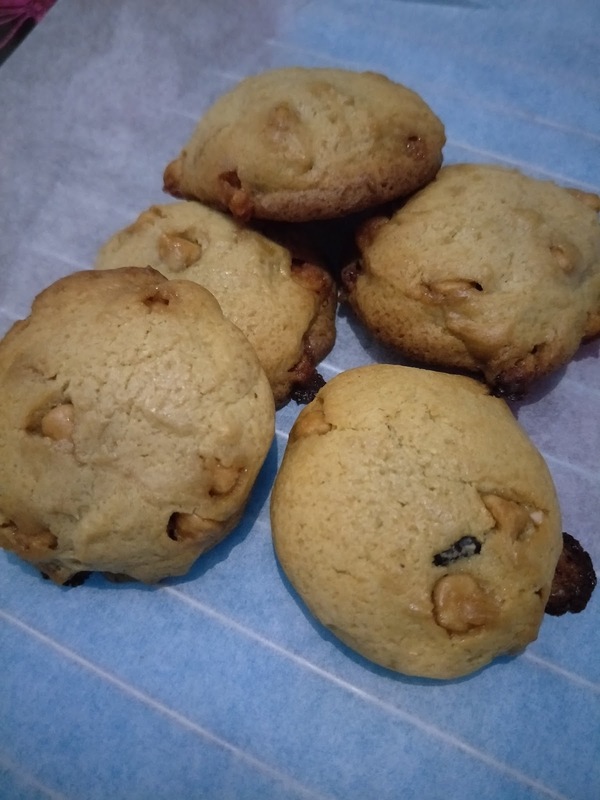 It's LAVA COOKIES, Y'ALL! Came across the salted caramel chips while randomly browsing the baking aisle at the supermarket and just decided to pick it up without much thought initially. Hahaha, and since I've bought it, I gotta use it right? 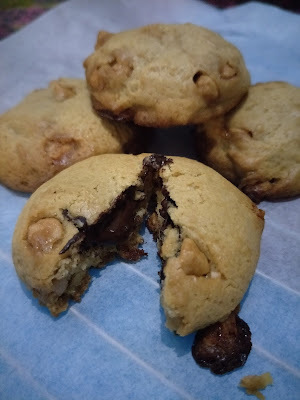 So yup, let's make some salted caramel chips cookies with a chocolate lava centre then! I used 70% dark chocolate, feel free to use milk chocolate or even white chocolate if you fancy them. First up, cream your butter and sugar together until the mixture turns light and fluffy, then beat in your egg and vanilla extract until well combined. Sift in all your dry ingredients and fold until almost combined before folding in the salted caramel chips. Your batter should be only very slightly sticky, but still easily pliable. Do add in some more flour along the way if you feel that your batter is too runny. Or else you'll have problems wrapping the chocolate cubes in! Then, wrap up your batter in cling wrap and leave it to rest in the fridge for 30 minutes to an hour for it to firm up. After the cookie dough has firmed up, take it out from the fridge and start wrapping your chocolate cubes into 1 heaping tablespoon of dough (I weighed mine and they're about 32 - 35g each). Feel free to pop them back into the fridge if you find that they've gone too soft to work with easily. 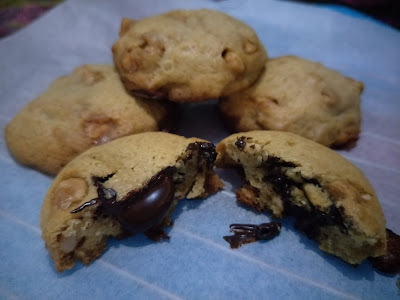 Then, place your chocolate-centre cookie dough balls on a baking sheet, spaced 2" apart and bake them at 190 degree Celsius for about 10 to 12 minutes. Keep a watchful eye on them at the 10th minute, they should just be slightly browned at the side and still pale in the centre! When they're done, they will still be quite fragile, so do be extra careful when transferring them over to a cooling rack. These cookies are best eaten warm, so do not leave them to cool completely before tucking in! Otherwise, you may also heat the cooled leftover cookies slightly in the microwave for perhaps 30 to 60 seconds to get the chocolate centre molten again before eating! Look at that molten dark chocolate centre! Best #cheatdayeat ever! Oh wow! This would be a nice treat for the kids! Especially now that holidays are fast approaching. We could use a lot of these. Thank you! #wellnesswednesday - What I eat in a day?